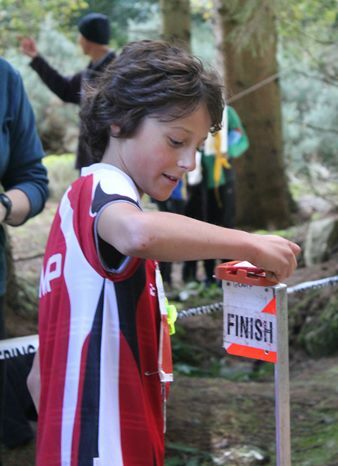 Three Gramp juniors had an enjoyable day at the Scottish Schools selection races for the World Schools Orienteering Championships which were held on Sunday at Faskally, near Pitlochry. Patrick Lang, Rory Halliday and Sam Griffin were representing Aberdeen Grammar and came a close second to George Watsons School in the team competition placing 9th, 8th and 3rd respectively. 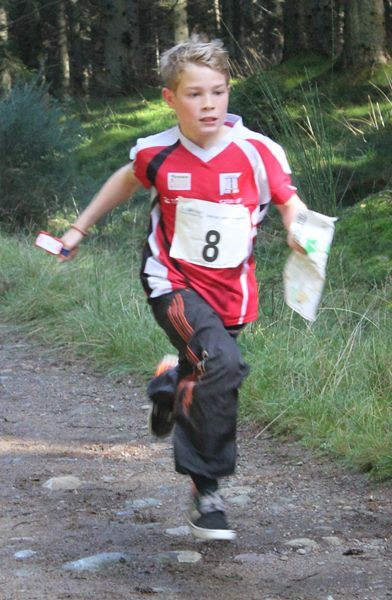 Sam’s result ensured him selection into the Scottish Schools select team who will travel to the World Schools Orienteering Championships in Estonia next April. Well done Sam! 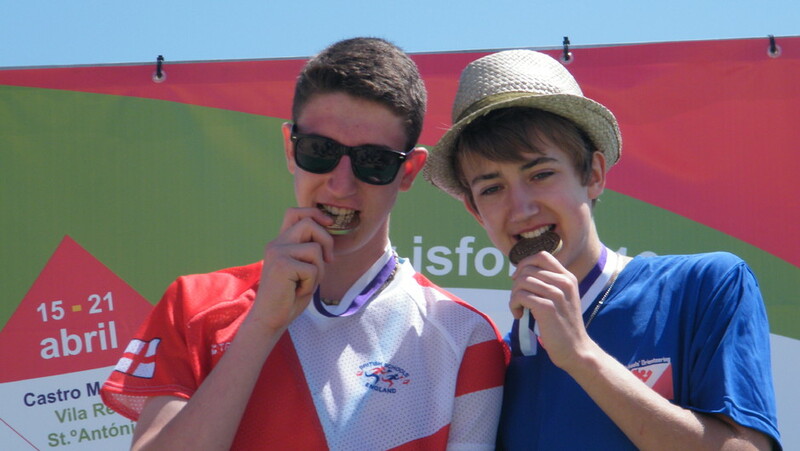 Several MAROC juniors have also qualified and Sam is teaming up with them to joint fundraise for their trip. The first fund raising event will be on Sunday at MAROC’s event on Pannanich where they will be selling the usual hot drinks, soup, cakes…. and if there is a big enough entry, chilli (meat and veggie). So if you haven’t got your entry in yet please do so, and bring your pennies, or preferably pounds, on the day. He wasn’t on the original list but was top of the reserve list after some strong peformances over the last months and gaining a Championship time at the JK. He joins 23 other M/W14 athletes who have been selected from all regions of the country to attend the camp. 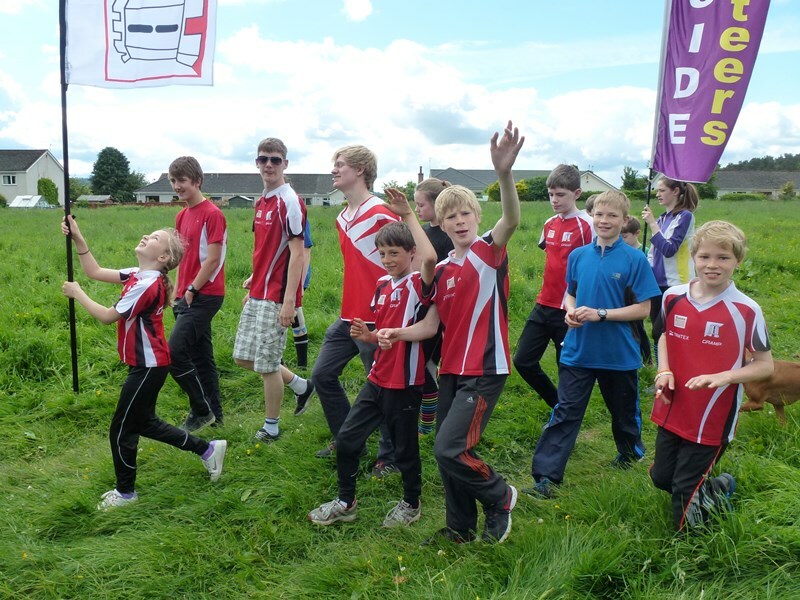 Junior Regional Squad training camps help juniors develop their orienteering skills and also aid personal and social development by making new friends, learning new skills and socialising in different ways. Congratulations to all the Gramp junior competitors at the Jamie Stevenson Trophy event at Braemar on Sunday. Amidst strong competition, especially from Maroc and Moravian, Gramp juniors made a great effort, gaining four top-ten places including a podium place for Sam Griffin on the boy’s Light Green course. Many thanks to everyone, especially Zoe, Tim and Laura for helping me (in my first JST experience) and as event helpers. 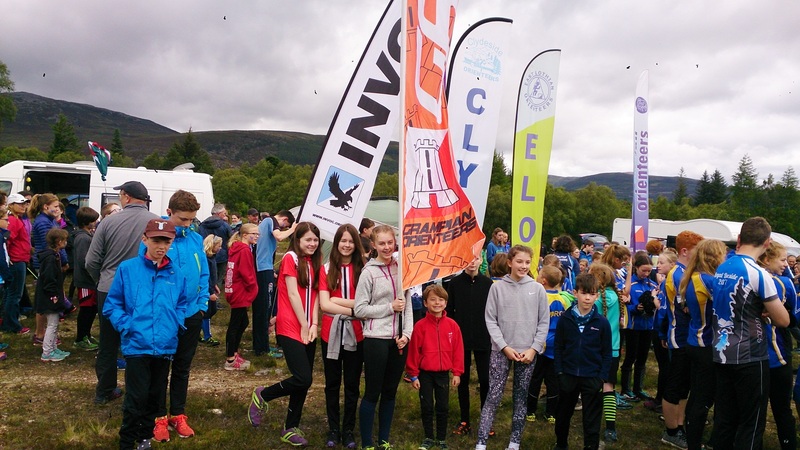 Big congratulations all round to the Gramp Team who ran at the JS Trophy today at Morrone Birkwood, Braemar: Mia and Olivia Coman, Morven and Kirsty Farqhuarson, Noah and Sam Griffin, Oli Robertson, Reuben Cole and Connor Whitelaw. Between them they scored 558 points coming 6th overall which is a great result for such a relatively inexperienced team. Report and photos to follow asap so check back here later. Congratulations also to the JST hosts, MAROC, who won beating MOR by just one point in the end. Jess Halliday is looking to organise another North Area Junior Training Day on 30th September, in the Grantown area. This is building up to the Junior Inter Area Competition on 28th/29th October. So calling all GJOs – if you’re interested then pass your names on to Carolyn McLeod and we’ll see if we can’t get a bit of backup for the twins this time. Some of our GJOs did their bit for the North Team in the Scottish Junior Inter Area Relay last weekend – well done Naomi, Hannah & Josie for flying the GRAMP flag. Full results can be found here . Gramp are proud to be joint hosts with Maroc for this year’s JIRCs which saw squads from all over the UK jetting in to compete and socialise with old friends and rivals alike. 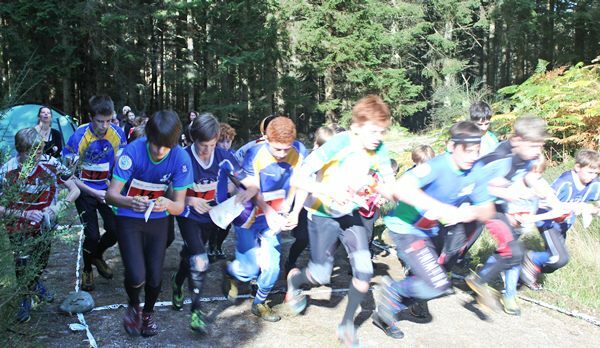 Competitors stayed at Cults Academy and buses were laid on to ferry them up Deeside for the Individual day and then north to Forvie for the Relays. Iain McLeod was the JIRC Coordinator this year heavily involved in organising the accomodation and support side of things, George and David Esson controlled the Individual event and Adrian Will was Organiser for the Relays. Congratulations to all competitors who ran at this challenging relay area. For Individual results and overall team scores, see the Maroc website. Helpers and others had a chance to enjoy Forvie, in the breezy but warm sunshine, after the Relays finished. Well the wrinklies were either too slow or didn’t chance their way past some very unclear mapping particularly in the old town of South Queensferry, so no Champs to report. 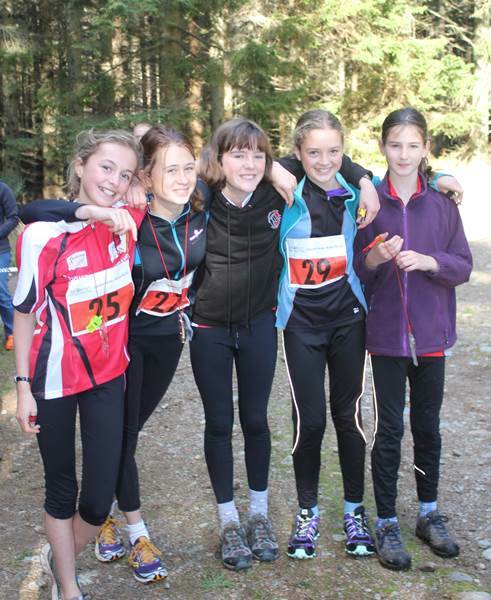 But the girls did well – Josie Gomersall was 2nd W16 and Morven and Kirsty took 3rd and 4th respectively in W12. A belated congratulations (she only found out herself last weekend!) to GJO Morven Farquharson on winning the Northern Lights W10 Trophy for her run at Loch Vaa, back in early September, where she was the fastest W10 on the Yellow course in a time of 23:15. Congratulations to Lachlan and Keith for taking their dads for a run round Coniston this weekend in the Saunders Lakeland Mountain Marathon. Tricky control sites (some even missing) and poor visibility on Day1 all adding to the fun. Keith and Dad 3rd in Wansfell class; Lachlan and Dad 13th in Harter Fell class; and congrats also to Jake and Dad (Maroc), 12th in Bedafell class. The girls got their first taste of big competition on Sunday at the Alvie SOL where between them they bagged 199 points for GRAMP in the North Clubs Inter-Club Junior Competition. Congratulations to you both! Congratulations to the North Team, including GJOs Naomi Lang, Patrick Lang, Ailsa Anderson, Keith Yardley & Alex Lang, on their comprehensive victory at this year’s Junior Inter-Area Relays held on a complicated little area close to the Falkirk Wheel. North won with 145 points, West 117, East 76. I’m told that Stirling YH survived a mass invasion by the North Team but haven’t heard whether there was a repeat performance of the marshmallow tower contest success. Naomi then went on to run again in the Inter Club Team Relay helping GO Gramp achieve 4th place against some talent packed teams from ESOC, FVO and INT. Sadly we should really be marked as non-comp as we never did find an eighth runner from Gramp despite our Team Captain’s stirling efforts to find someone (thanks for doing the honours, Evgueni, as well as driving for the JIAR crowd.) Instead we co-opted Martin Wilson of BKO who did us proud on the last leg but the rest of us deserve a pat on the back too for managing to avoid the mini mass start and not mispunch. There’s 7/8 makings of a good Gramp team already – maybe, just maybe, next year….? Links to overall results and individual performances. Update – Some great photos from Pat Graham (Maroc Mum) here – everything from agonising waits in the pen to action-packed handovers. Yes, this is a bit late after the event but we’d hoped that maybe ScotJOS had been secretly engaging in some media training and if we hung on we might have heard all about it from Sasha himself. The BOF website echoes this sentiment too so it only remains for GRAMPs to add their congratulations. Make sure you shake his hand next time you see him at a Summer Series – it could be your claim to fame in a few years time!! Photos from Carolyn now on Flickr – more to follow. Overall position 5th at the Jamie Stevenson Trophy today. WELL DONE to you all for taking part. I thought you all competed very well despite the mud and drizzle! You had great team spirit especially when you stayed by the finish to cheer everyone in. Definitely a credit to Gramp. I was very proud of you all and very much enjoyed the day. Well done to our two podium positions: Naomi Lang, 2nd on Light Green and Calum McLeod 2nd on Green. Finally on behalf of everyone I would like to say a big thank to Evgueni for driving the minibus once again. There are some cracking photos of some of the GJOs, mud-caked but still smiling (mainly! ), on ActivNorth’s website aka Chris Spencer of Scottish 6 Day photo fame. I’ve asked if we can purchase some for our archives even though his cart isn’t set up for business just at present. Anybody got any other homegrown photos to share? Send Rachel the link or files please to webmaster@grampoc.com. If you want to see the full results and who scored what, check here. BTW – the latest (JD)2C points are up now after the Glen Fearder event. Click here for those. Sasha, along with 5 other ScotJOS colleagues, was rubbing shoulders with future champions at the European Youth O Champs in Portugal recently. Dominated by Switzerland, Sweden, Finland, Denmark, Russia and Czech Republic these champs certainly gave our homegrown talent a run for their money but it looks like they relished the challenge – take a look at the write up on the SOA website. Well done guys! Results etc on http://www.eyoc2013.fpo.pt/ or check out the gossip and pics on EYOC FB. Never has that little triangle of wood in Scolty been sooooooooooo noisy! The enthusiastic cheering was deafening at times especially when Daniel Stansfield and Jennifer Ricketts came storming down the final track to clinch first place for their teams West 1 and North 1G in the Open and Girls classes respectively! Congratulations to the winners of course but also to everyone who took part and gave it their all, especially the many for whom it was their first taste of the buzz of relay racing. The basis for the scoring is, in each class, 24 for 1st, 20 for 2nd, 16 for 3rd, 12 for 4th, 8 for 5th and 4 for 6th – but only 2 teams from each of the 3 areas count. So, in the Open it was West 24,4; East 16,8; North 20,12. In the Girls it was North 24,12; West 20,16; East 8,4. Photos from Marianne Lang – if anyone else has some photos they’d like to share then send them, or a link, to webmaster@grampoc.com. 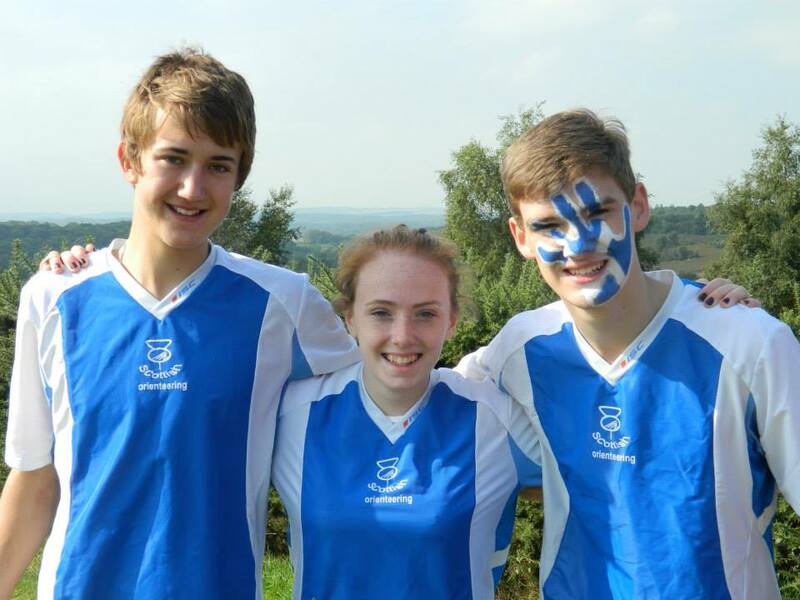 Well done guys – Scotland won all 5 trophies again this year and Sasha, Karen and Calum were there to help the team to victory, putting ScotJOS up at the top of the regional squads!! There’ll be a report on the SOA website soon but in the meantime feast your eyes on these photos from Wendles. Meanwhile, over in Ireland, Jack Gomersall came 3rd M20 to help Scotland clean up in the Senior Home Internationals too. Wow! 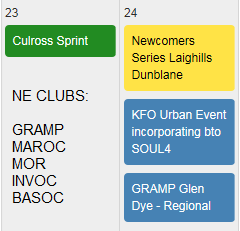 What a week for Scottish orienteering! 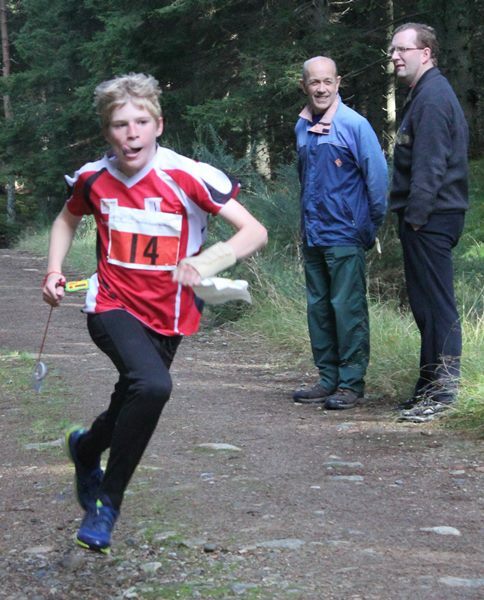 Sasha and Calum ran for Scotland in this year’s Junior Home International which took place in South Wales, near Merthyr Tidfil over the weekend of 14/15 September. Results were a win for England, with Scotland 2nd helped a lot by Sasha’s 3rd place in M16 no doubt, then Wales 3rd and Ireland 4th. Well done guys! Sadly not quite enough to knock Maroc off the top spot again this year, with GRAMP finishing in a respectable 6th place, but still a very “Well Done!” (in no particular order) to the whole GJO team: Maya Reynard, Josie Gomersall, Katrina McLeod, Sasha Chepelin, Calum McLeod, Jack Gomersall, Paul Caffyn, Struan Kirk, Lachlan Kirk, Keith Yardley and Alex Lang. There’s a comment on the SOA website about various sponsors for the event, so the burning question is did anyone from GRAMP manage to win a Tunnocks Teacake? Couple of photos which should enlarge if you click on them – there’s a promise of more if Carolyn remembers to give me a memory stick at Kingshill next week. First one is the traditional JS opening parade but what are they up to in the second? Individually Team McGramp also had good results: 4th W45L, 10th M18E and 6th M50S respectively. Several other Gramps were in attendance too including the Hicklings, Bob Daly, Paul Duley, the Armitages and at least one Hale and Chepelin that I spotted in the results. 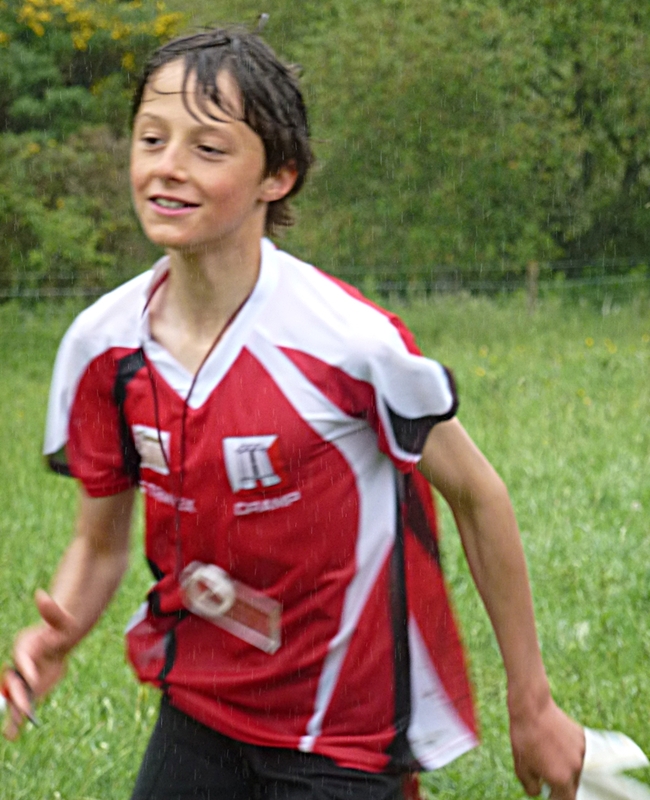 Sasha kept up his winning form post-JK by taking top spot for M16A. Well done to Maya Chillingworth and the Robertson Kids for flying the GRAMP flag at the Junior Inter-Club Competition at MOR’s Quarrelwood event recently. Between them they scored only 1 point less than the full team of ten from MOR! The big surprise of the day was INVOC managing to beat MAROC to the trophy so congratulations to them too. Don’t know what the woods were like for the Juniors but our woods on the other side of the road were so full of fallen, but still crispy, beech leaves that it was like running through ankle-deep cornflakes a lot of the time! Sasha and Katrina went waaaaaaaay down south to Surrey over the weekend to help the Scotland Team gain 2nd place at this year’s Junior Home Internationals. It’s a two day event with an Individual race on the Saturday – Sasha was 4th M16, Katrina 5th W18 – followed by a Relay on the Sunday where the age classes are mixed up – Sasha’s team came 4th in the Mens and Katrina’s 8th in the Womens. Overall results: England 141 points, Scotland 106, Wales 62 and Ireland 51. 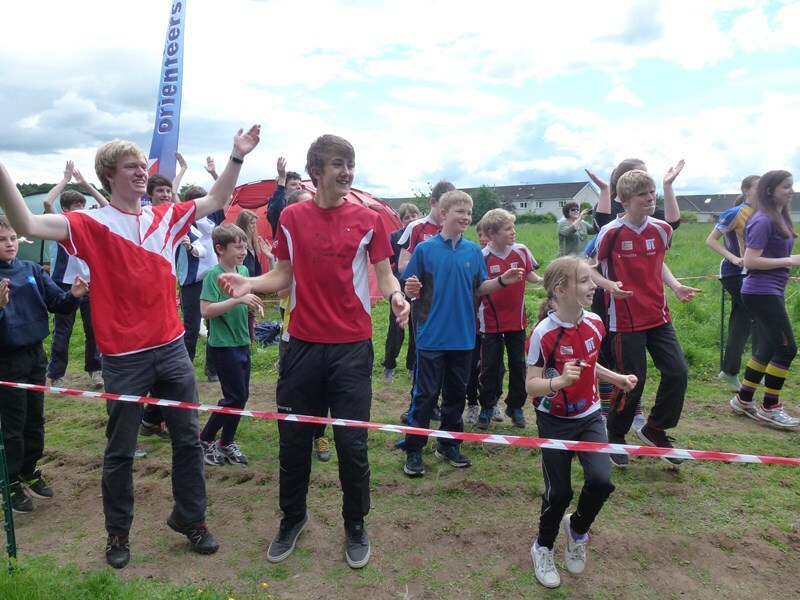 As well as the serious racing there are usually some other activities and competitions for everyone to mess about and relax a bit and have some fun with folk from the other teams. I’ve yet to hear what they got up to this time – maybe Sasha or Katrina can spill the beans? Well done to Lachlan Kirk and Naomi Lang who chalked up brilliant 3rd and 4th places in this year’s Stoney Stomp 10k, with times of 42m 18s and 43m 52s respectively. 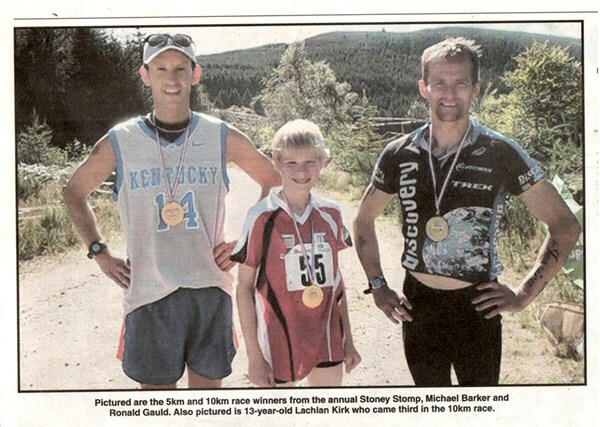 And it was a pretty hot day on a tough hilly course at Durris Forest so even more of a result. There’s a picture of Lachlan in the Mearns Leader with his bronze medal gleaming in the sunlight and he’s wearing his GRAMP top. Good man! Nothing like a good bit of publicity for the club!